Thats right, I seem to think I can pull both of these off by December. Hahahahahahaha! But if I start now, it’s certainly more likely. I’ll be addressing the Loopy Trimmed Cardigan first. 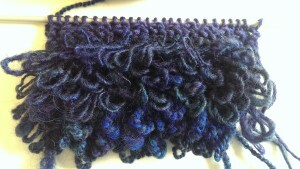 This pattern is from Vogue Knitting, which I have a subscription to, so I already have the pattern. One annoying thing about Vogue patterns is that they have a lot of errata, so I always check Ravlery before I start and see what the issues are. This one looks pretty straightforward, and the photos posted of finished projects all look great. One thing that was mentioned a couple of times is that the button closures don’t really hold the front closed all that well. One person mitigated this by seaming the front shut and turning it into a pullover. After looking at the photo in my magazine copy, I can see that there’s a straight pin holding the front shut in between buttons on the model. Really! I’m more surprised by the lack of photoshopping than anything. My solution is going make five buttonholes instead of three. I looked around in my stash to see what I wanted to use for the body and the trim, and I found some navy dk weight Rowan merino/cotton that I *think* I have enough of for the body. It’s a little bit matte because of the cotton, but the stitch definition will be really great for showing off the cables and bobbles. I didn’t have a good coordinating colored yarn for the loopy trim, but, I have a lot of fiber, so I can certainly make some up. 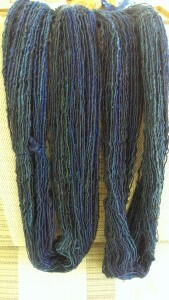 My navy yarn changes color depending on what else you put next to it. Navy next to navy, purple next to purple. 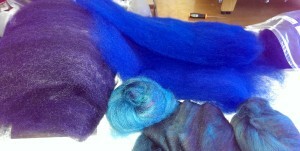 So I got my drum carder out and started blending. 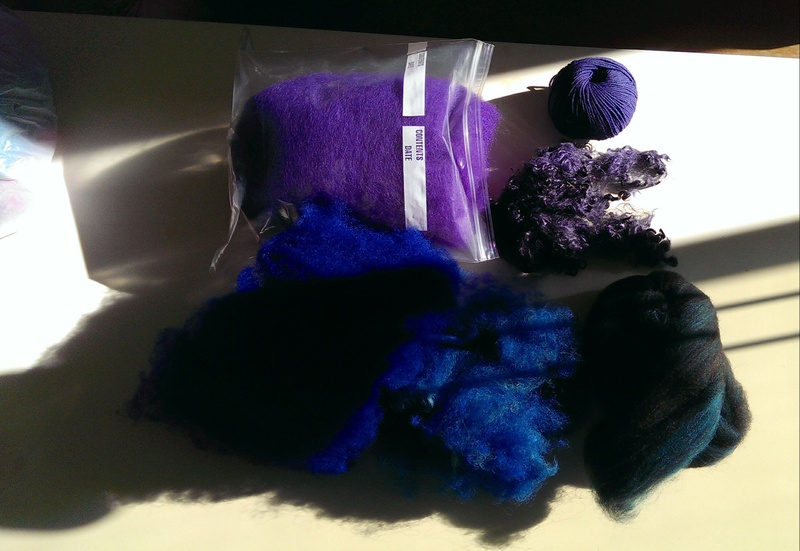 I’ve some navy Shetland and mohair (from my goat, Blue) that I dyed, some violet Shetland/Cheviot that I bought from a lady in my Guild, some Prussian blue Shetland that I also dyed, and a couple of small batts I made up from some teal/brown/navy Polworth/silk blend that I bought at OFFF last fall. I ended up with the navy/purple color way of the commercial yarn, and analogous royal and teal blend color ways to add some variety. Holiday oomph, if you will. So then my only question is how do I want to spin this up? I did three swatches. The first one started out as a single, but I didn’t like how much color separation there was next to the commercial yarn, so I plied it on itself to see if that helped. That’s the center one in the photo. So I blended my batts together some more, and did a single to match the dk weight yarn, and a two ply, to see which I liked better knitted up in the loopy pattern. The single really does it for me. It’s almost like an exaggerated boucle, especially with the mohair halo that it has. 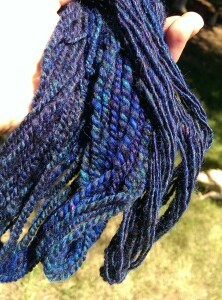 The rest of the fiber is spun up and set, about four oz. All that’s left to do is cast on! 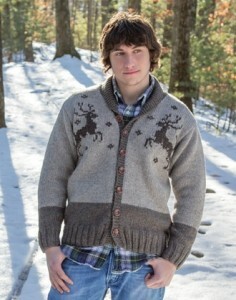 Up next: decisions about the Buck cardigan. I love the Loopy Cardigan. 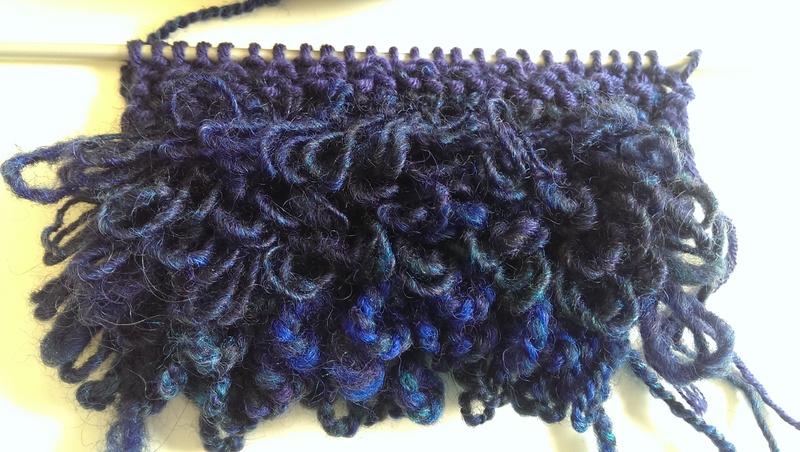 Top tip about checking for errata and looking on Ravelry before diving into a project. Also, your colors look fantastic. Wow! !